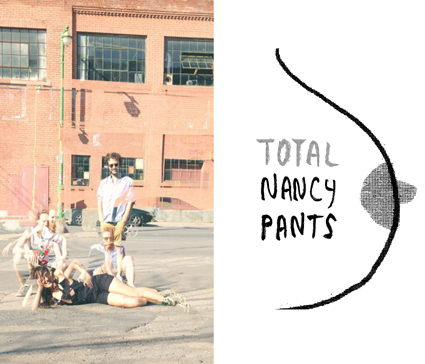 Montreal’s Nancy Pants are set to unleash their debut full-length album ‘Total Nancy Pants’ on Thunder Bay! Friday Feb 13 at Defsup, for one night only, and you’re invited. Calling themselves a “dirty pop band,” Nancy Pants reintroduces a few familiar Can-con faces with Ohara Hale (Mori, Ohara), Adam Waito (formerly of Thunder Bay-you know him-Adam & the Amethysts, Silverkeys, Miracle Fortress) and Jeremy MacCuish (Parlovr, Nanimal, Smokes) comprising the lineup. Formed en route to an indie comic book convention, the trio recorded a five-song demo after just one band practice. Now, their repertoire has grown into the 11-song collection that is Total Nancy Pants. A recent press release describes their sound as “teenage ’60s garage pop and weird ’90s punk,” which pretty much nails it and Exclaim magazine says “this marks an assured and enchanting debut for this Montreal trio, and cements them as yet another Montreal band to look out for!